First of all, let me tell you, I am one of those people who HATES being sick. I will do just about anything to avoid getting sick. While I think a part of me liked getting sick, in high school (because it meant you could stay home and watch soap operas), I absolutely hate being sick as an adult. I hate being in any state where my energy is reduced and my thinking is impaired. Being sick is almost worse than being drunk. I used to get sick at least twice a year - it was just something I could count on. I guess I didn't have the best immune system. I'd tried different things, in the past, to beat a cold, from taking lots of vitamin C pills, to vitamin C powder in water (with a little sugar so it's bearable), to echinacea in pill and also liquid form. I'd also done Zinc, Emergen-C, and Airborne. But none of those things really got rid of a cold the way I'd have liked it to work. Then, in 2001, my sister told me about Wellness Formula. And it changed my life. CLICK HERE to see it (and all the reviews) on Amazon. The day she introduced me to it, I could tell I was coming down with something because my first sign is almost always a raw, sore throat. She pulled out a little ziploc bag full of beige capsules (her travel stash) and handed me six of them. "Take this. It'll go away." I looked at the large pills in my hand. "Six?" I said. "That's a lot of pills." "Trust me. It's worth it." She said. "It works better than anything." I took them and HOLY MOSES. She was right. Whatever it was, that had been coming on, JUST VANISHED. Why did it work so well? Because this stuff contains just about everything known to mankind, to kill a cold. 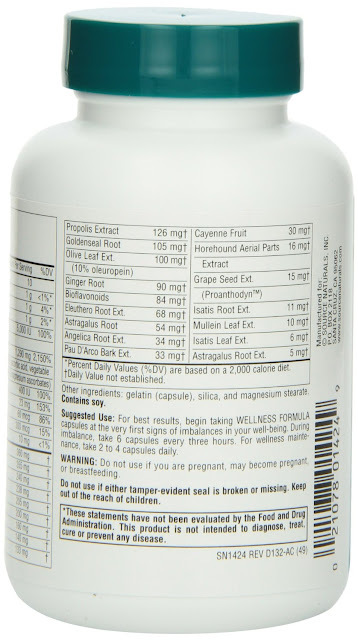 You know how some people say take zinc, some say take vitamin C, some say astragalus, some say take echinacea.... well these pills have all of that and way more. I'm telling you. It's unreal how well it works. If it doesn't completely knock out a cold, it should reduce your symptoms, or cut your sick time in half. At least that's how it's always been for me. This past winter I did end up getting sick because I didn't recognize the early sign of a particularly nasty bug that had been making the rounds at my office. I had developed a scratchy throat, and because it wasn't the usual raw, sore throat I get before a full blown cold, I ignored it and didn't start pounding Wellness Formula like I usually do. BIG MISTAKE. I ended up getting sick with a high fever and horrible body aches, and had to take the day off work! So just be aware that sometimes colds can come in different forms and your symptoms may be different, depending on the strain that's going around. Luckily the Wellness reduced the amount of time I had to take off but still.. I hate even having to take an hour off, much less a day. In the last 14 years, I have only been sick a couple of times, thanks to Wellness Formula. Since then, I've bought it for many co-workers, employers, friends and family members. When I told my Aunt about it, she was a 4th grade schoolteacher. She told me when she talked to other teachers in the "teacher's lounge" at her school, they said "Don't you know about that stuff? We're ALL on it!!!" If you want to know the latest in what will effectively knock out a cold... check with an elementary school teacher! (Note: another friend of mine, an elementary school teacher in her 20's, told me that when I shared my awesome water with her, she never got sick when all the teachers around her did... I'm thinking it must be the antioxidants). I recently took a self defense class, and I realized that protecting yourself from predators is like protecting your immune system. The predators and sick people are always going to be out there, so it's up to US to do what we can to protect ourselves. Germs are EVERYWHERE, and if we're not armed to stop them, they will bring us down. Luckily, Wellness Formula is not hard to get. They have it at Whole Foods, and it's often on sale. I have a friend who was complaining about how someone at work got her sick. I will call her Peggy. I told her Peggy, you need to protect yourself. There are always going to be sick people at work. It's up to US to make sure that other people don't make us sick! It took me years to convince her to try Wellness Formula, but when she finally did, she was blown away and actually bought it for a bunch of her friends at work, just like I have! This stuff even knocked out the FLU a couple of years ago. I had been working at the airport and touched just about every pole and handrail there was in the place, before getting in my car and going to get dinner (mediterranean food). Normally I like to wash my hands before eating but I was so hungry, I picked up a piece of bread and ate it. Within an hour, I could feel my immunity rapidly dropping. I realized I'd just swallowed somebody else's Flu bug. I loaded up on Wellness Formula and that night my body felt under attack, my heart beat faster but I didn't actually feel sick. It's hard to describe, but I just knew there was a war going on inside, between these flu germs and the Wellness Formula. I could feel it. The only way I can think of to describe it is.... it reminded me of being in a hurricane with all the windows taped and you're just waiting it out. You can feel the power of what's raging outside, yet it's not hurting you, but you can feel it. That's how it was. I don't know how else to describe it, but that hadn't happened before, and it hasn't happened since, but that one instance made me feel sure this stuff has the ability to knock out the flu. Whatever it was my body was battling, was HUGE. By morning it was like the morning after a storm. Everything was calm again and I was back to normal. If you ever find yourself getting sick, please try this stuff. Check out the reviews on Amazon if you don't believe me. I'm telling you, it's the stuff that's not well-advertised, that works the best. Be sure to keep it in the fridge, it will last a lot longer. The only time this DIDN'T work was when I left it out too long and didn't refrigerate it. Oh yeah... and I always take the capsules, not the tablets. I've heard some people say the tablets work well but I just can't take them. The smell makes me kind of nauseous (and since it made me feel sick that just seemed to make me feel worse). It's up to you, but I've never had a problem with the capsules at all - they work great. PEMF: The NASA technology Dr. Oz told everyone to tell their Doctors About! OK so I don't have time to write about this technology at this very moment but I was so excited about it a year ago, I made a whole blog about it!! You can see my blog at www.PEMFAdvantage.com. Seriously. I was so darn excited about this technology, I wanted to open up a PEMF store and was scoping out places where I might be able to open up a retail location. Here's part of the Dr. Oz show about PEMF. He encouraged all the people in his studio audience to please tell their doctors about it! We just purchased a BEMER machine, and in my opinion, it is the best one there is. If you would like more information about this machine, please get in touch with me via the contact form to the right and I will send you a TON of information! We started out with a Pulsed Harmonix machine, which seemed to benefit my husband but in all honesty I couldn't tell a difference in my energy level (though I did like the way the pulses felt from the coil, while I held them). We got this machine partly because I was very impressed with how much it was able to help this American Bulldog, Elwood, heal from an injury. Seeing him bounce around like a puppy makes me so happy every time I see this video. Part of the reason I got so excited when I learned about Electrolyzed Reduced Water, is that the "before and after" pictures, showing blood cells from a person who drank electrolyzed reduced water, looked so much like the before and after photos I'd seen from people who'd had a PEMF treatment. Below, you will find two videos that will show before and after results of Electrolyzed Reduced Water, as well as PEMF. I love that I can share both these technologies and products with people. If you'd like to try either PEMF or the water. just get in touch with me via the contact form to the right. OK so this is another one of those posts I don't really have time to work on right now but I'm putting this here in the hopes that even just one person might benefit from reading this. My friend and mentor, Monica, told me about this connection and when she did, I yelled "WHAT?!?!?" so loudly, my cats scattered and ran out of the room. I had never heard anything so absurd, and I've heard of some pretty absurd things (that were backed up with a ton of evidence). I've heard of some pretty crazy connections between things.... like hearing about "magic healing water" that was shown to help people with various health conditions.... or the fact that there seems to be a strong link between Candida and Autism.... . But this one took absurdity to a whole new level. Because I don't have time to write out a whole post about this at the moment, I'm just going to post a link from a woman who does a fantastic job of explaining the possible connection, on her website, AnnCredible. Huge thanks to Ann for this detailed post. It's the best explanation I could find on the web!!! UPDATE 6/1/16: Ok I have just had a breakthrough.... OIL OF OREGANO ABSOLUTELY POSITIVELY WORKS BETTER THAN ANYTHING I HAVE EVER TRIED FOR CANDIDA. I'm going to just give you a quick update and story as to how I learned about this, and it was all by accident (funny how I seem to find some of the best treatments by accident). I started taking Oil of Oregano to heal a tooth abscess that started last year after I cracked a tooth. The pain was so bad it was like someone sticking an ice pick into my eye. Well, lo and behold, the stuff seemed to work, and I was using it so regularly that I realized I needed to order more. So, I went on Amazon to find a good brand, with good reviews, at a good price. I was surprised to find several reviews by people raving about how much it helped them with their Candida. And that jarred my memory... I did try Oil of Oregano once before, but it was in pill form, and I just got a cheap brand (I think I got it at the Vitamin Shoppe) and I didn't take that much, and didn't take it that regularly. I had been using Oil of Oregano Drops on my tooth abscess ONLY, and then spitting it out. But when I saw the rave "candida prevention" reviews for the brand I already had, I decided to go ahead and swallow the stuff (I realized I had been practically throwing money down the toilet by just spitting it into the sink). I'd say I was probably using 4 or 5 drops at a time (Please note, I heard you are not supposed to use this stuff for that long, and it is a blood thinner, and you shouldn't use while pregnant, and if you have allergies for "sage family" drugs you may have an allergic reaction with this). Anyway, I started swallowing the stuff, and really, it was not difficult. Yes, it burns somewhat, kind of like eating spicy food, but if you mix it with water it is no worse than putting a few shakes of tobasco sauce on your food. Well, today was the true test of how well this stuff works. I am ashamed to admit this but... I had a LOT of sugar today, and I mean A LOT. Like, let's just say it was an amount that would normally make my feet soooo itchy I'd be in an incredible amount of discomfort. But at around 6pm, it hit me. My feet didn't itch at ALL. It's true, I did soak them in a NEW batch of 2.5 acidic Kangen water, and I am pretty sure that helped a LOT. But here is the thing... the 2.5 acidic water is really a topical method of treatment. It can only do so much if you KEEP eating sugar. Because my candida is systemic at this point. It became an internal problem, and I imagine it is all over in my system, and for whatever reason it seems to accumulate in my feet. But today was the first time I've ever seen such a drastic reduction in my itching... honestly, it was like, there just was no itching at all. It only occurred to me later, how miraculous this was, given how much sugar I'd consumed that day (sometimes the itching prevents me from eating more sugar, but since there was no discomfort it didn't occur to me to stop). I realize this could be a curse as well as a blessing... I really still have no business eating a lot of sugar, but caffeine and sugar does seem to help me blaze through creative projects, so this is just good for me to know for future reference. 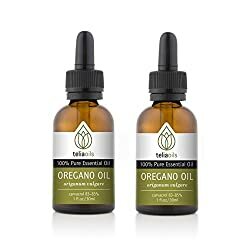 I've posted below, links and photos of the type of Oregano Oil I used. I am really grateful to the people who wrote about it on Amazon, because it never would have occurred to me to swallow this stuff!!! I'm going to add a lot more details to this post, but I just want to write this quick post after seeing a commercial for Kerydin, and then I saw another one for Jublia. These medications do nothing to address the root cause of toenail fungus.... which is CANDIDA. If you don't get rid of candida, you're going to have to keep taking dangerous medications in order to try to get rid of the problem. The root cause of candida is SUGAR. I'm planning on writing another post about the link between candida and autism. I know, this sounds completely absurd. I thought so too. Until I looked it up, and it made sense. Now I feel like more women should know about this, because this is another one of those super simple (yet huge) things you are likely to NEVER hear about from your doctor! I'm not saying candida is the ONLY thing that could cause Autism, but I believe definitely a risk factor that most women don't know about. Candida can affect the development of a baby's blood brain barrier, which can make them susceptible to infections and problems after vaccination. Please look it up yourself and then decide. I know I'm getting off track but I am putting this here now in the event that it could help someone. Because I have had a pretty bad addiction to sugar in my lifetime, I can tell you from EXPERIENCE that you can try treating fungus (which is caused by candida which is caused by excessive sugar) with every medication and topical treatment in the world, but if you don't actually get rid of the root cause of the fungus and candida, it's just going to keep coming back over and over again. The best thing I found to treat fungus (aka Athlete's foot) topically is Kangen 2.5 acidic water. I'm not kidding, that stuff was incredible. Worked better than any cream I'd ever tried. In the past I found there were other things that had helped, like probiotics (20 billion live cultures daily) and coconut oil applied topically. But NOTHING worked as well as that acidic water. You can see a video on the page I made showing how it helps different skin conditions, at www.TheBestKeptBeautySecret.com. As helpful as the acidic water was, I had to keep doing treatments because I was stubborn and didn't want to give up sugar. Expecting the problem to just go away, without attacking the SOURCE of the problem, is like turning on the bathtub faucet full blast every day, plugging up the tub, letting the water keep running, and wondering why there's always water that's spilled out onto the floor. Your body can only handle so much. I kept hoping I could figure out the cure so I could keep on keeping on with my nasty habit. But nope, I finally realized, the only real fix was to get rid of the source of the problem. Tubs can only handle so much water, like bodies can only handle so much sugar. It was only when I finally cut out the excessive sugar in my diet (in the form of powdery drinks) that I suddenly realized my candida issues were no longer an issue. It was like a miracle. My feet actually felt WARM, for the first time that I could remember in my life (I usually have a slight case of Reynaud's syndrome - cold feet and hands). I'm sure the Kangen water helped because it improves circulation and did seem to alleviate the candida somewhat, but there was only so much the water could do when I kept assaulting my body with sugar! Oh yeah... and I finally got a decent "spit test." When I spat into a glass of water, after eliminating about 95 percent of my daily sugar intake, I couldn't believe I actually had mostly normal spit floating at the top of the glass. If you're not familiar with the test, go ahead and check out this video (not by me). My spit used to look a lot more like in this video, but it's gotten way better. I will upload a picture of my "new and improved spit" when I can find the pic I took about a month ago! You can also get rid of a certain amount of candida by drinking green juice, and doing apple cider vinegar enemas. Also, I heard Oregano oil helps (note: I heard about Oregano oil through a woman who made a great video about how it helps with a tooth abscess, and I am making a separate page regarding a tooth abscess I developed in October). I am pasting the reviews I read, for the brand of oregano oil that seemed to help people get rid of candida (they did do some other things). I did hear you are not supposed to do this for too long, and a friend who was taking this as an antibiotic said it burned when she went to the bathroom (but I think she took it in pill form and was taking a LOT... will have to check with her on how much she used). You can see a pill form version HERE (this one has 5 star average reviews). This is the type that is written about in the reviews below. I do love Source Naturals Products. The type I have been taking to heal a tooth abscess (writing a post about that soon) is Oreganol, which seems to work ok, but I just heard there is a "Super Strength" version that has 5 star average reviews (over 200) so I may get this type next. Also, another brand I was looking at this morning. It is super strong and shipped from Greece. It seems to have great reviews (5 star average) and you can save money by getting it in a 2 pack (if you will use a lot of it). I am surprised by how quickly I went through my 1/2 oz. bottle of Oreganol (once I discovered how well it works) so I want to stock up! That small little 0.45 ounce bottle of Oreganol cost like $22 at the Vitamin Shoppe, and it's not even the "Super Strength" kind. So getting it in this 2 pack is about 1/3 the price (including shipping). I didn't want to take it because of the taste....it is very strong. My candida was so bad that I thought I was loosing all my good health. First Some of my hair fell out & wouldn't grow back, then adult severe acne& brown areas on my face near my mouth (like dirt under my skin had set in , then body odor also a puffy stomach. These were all things I hadn't encountered I was pretty scared & first just started Paleo dieting & exercising, that made me exhausted & was not working like it had in the past. So I stopped drinking wine & I started taking candida killing products Grapefruit seed extract & cyprilic Acid I could feel some differece but not total healing, just enough to let me know that I had a serious candida problem that GSE & CA didn't seem addiquit to help. Fast forward four months &Those problems are gone & People are amazed by my hair,,,& I am amazed by my hair.... I have not had healthy hair like this since I was a teen. My acne & disquisting body odor are gone also . Also strangely IBS that I had for many many years is gone. If you have Candida,DON'T WASTE time with stuff that helps slightly. take 2 or 3 drops of this Oregano Oil in 8 ounces of water mix well then just chug it down! do this 2 or 3 times a day for a while then back down the amount and continue treatment for a few months. ((I don't know about other Oregano Oils I have only tried this one & I will not switch). From my experience Don't just discontinue any candida regiment because candida will come back maybe stronger. Eventually you should be able to back down to a few drops in water once a day. but remember candida is in ALL of our bodies all the time waiting for enough carbohydrates and sugar or alcohol (wine in my case) to spring into action & reak havok on your health. I will keep this in my arresenal forever!!! This product does what all the other candida killers try to do but 100 times better.Because of the water it seems to reach every part of your body. I wasted a lot of healing time letting this sit on my shelf because of the taste. I tried ALL of the other products.They just bandaided the problem. I am so happy that I fanally wised up!!!! 5.0 out of 5 starsAbsolutely Phenomenal! I have never taken OOO before but I can tell you that I am blown away. My sinuses cleared up within hours after 2 drops, and I didn't even have a cold. I also brushed my teeth with a third drop and Coconut Oil before bed. Day two 3 more drops in my system and the white blotchy coating on my tongue ( suspected candida overgrowth in my system) is half gone already. I am stunned. I heard it worked fast and it is no joke. Yes the tase is strong but who cares with results like this. I will be working my way up to abt 10 drops a day for a short time to see how it helps my other candidasymptoms. I am also using it topically on the actinic keratosis on my temple going with the cancer is a fungus research. Lastly, $15 for 1 oz is fantastic. I will stick with this brand because they make it so affordable with great results. The more expensive companies would rather see profits than truly helping peoples health. Do not brush your teeth with this often as I have found that it irritates the gums and if I put it under my tongue more than a couple drops a day it causes serious irritation to that soft tissue. It is just so strong. I mostly take it in a little water and shoot it. The AK on my temple after two weeks is mostly eaten away and with no cracking and bleeding like the Efudex garbage from the dermatologist. There is just some peeling and nice smooth skin underneath. I have been diluting it with coconut oil which has vitamin c powder mixed in. Very pleased so far. Antioxidant, Antifungal, Antibacterial, Anti-inflammatory, Antiasthma, Anticarcinogen, Antihistamine, Anti-E. Coli, Anti-Candida, Antipsoriasis, Anti-indigestion, Antiallergen, Antiparasitic, Antiseptic, and many more health benefits. 4.0 out of 5 starsWorks for candida! 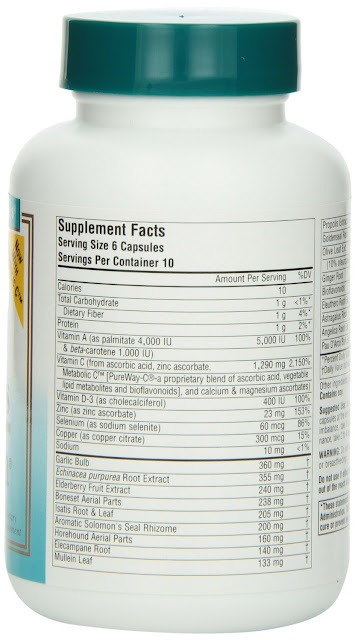 I've had candida problems for a few months now, and after only a week of using P73 the problem is practically gone. I was already following a candida diet for 4 weeks and taking Undecyn for 3 weeks. So to anyone using it for candida- it works!!! But take it super slow and drink a TON of water to prevent getting any die-off symptoms. You really only need one capsule a day (or every other day) because this stuff is so strong. It's a small but mighty capsule. Seriously. You don't want this rash. 5.0 out of 5 starsSmall caplets...strong medicine! This is a great product for cleansing candida/parasites and whole body. I have been using it for a few years now, and the capsules are much easier to take than drops! I also like the small size, because a little goes a long way. In the beginning I would have so much die off that I was sick with flu-like symptoms for about 24 hours and mouth sores. Then I discovered OxyPowder which helps with the toxic load. At first I would only take one tablet every two weeks because it was so strong for me. Now I can do once a week. I'm on my third bottle overall and I even give to my teenage children when they are in need of cleansing. Oregano oil is a huge combatant against yeast and does not give off the powerful odor that others may notice if you take garlic tablets. This is another great quality product that can be use to help a few different things. It is suppose to help with breathing problems. It is suppose to help fight (candida) yeast build up which can cause breathing problems, and it helps with sinus infections, which I have been told can also be caused by (candida) yeast build up. I like it is part of the subscribe and save program. When I have taken, I have had reduced breathing problems and has less problems with anything sinus. I had a severe case of systemic candida and these oreganol softgells cured the problem. I only take one a day for maintenance. Awesome to kill thrush in your mouth andcandida killer. 5.0 out of 5 starsIt's the Best!! It's the Best!!! This oregano helped me with a flu when nothing else worked!!! Plus it's great for Candida and other fungus! This is my third bottle - I love this stuff. Using it right now for treating Candida. I have not been sick once yet! Great quality and this is the cheapest price I have been able to find. Wild oregano oil, in and of itself, is a blessing. I have to take 4 - 6 of these in one sitting to have any effect on my candida rash. For me, it's not a cost-effective treatment plan. There are other WOO alternatives out there that have a higher ration of oregano oil to olive oil and cost far less.